Rachel Dorris gets 'Mo Routy"
It only made sense that Rachel Dorris would develop a fondness for horses since she grew up in a family with a background in the industry. 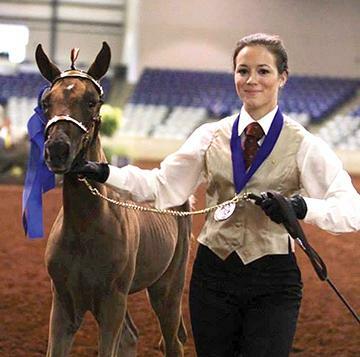 Through the years Dorris’ fondness developed into a passion and she has proven to be one of the best in the business as evidenced by winning the International Grand Championship for Weaning Fillies in Murfreesboro in July. In fact, Dorris won two blue ribbons at the International while showing “She Mo Rowdy.” She not only won the Open Class, which includes professionals, but she also won the Youth Class for Weanling Youth Champion. Dorris, the daughter of Vivian and John Dorris, didn’t have too much time to bask in her International glory. The senior at Cannon County High School began competition at The Celebration in Shelbyville last weekend and will show, “She Mo Rowdy,” in different classes there this week. Dorris began showing colts four years ago and admits she is surprised at her sudden success. Her dad is one of Rachel’s biggest fans but even he is somewhat taken back by his daughters rapid success. Rachel has ribbons to prove how good she is. “She Mo Rowdy” is owned by the legendary Bill Harlin of the famed Harlinsdale Farm in College Grove. In recent years Rachel Dorris has had the opportunity to show colts owned by some of the biggest names in the industry, including Harlin. Her passion was derived from spending time on the farm and at shows with family. Evidently, John is a good teacher or Rachel is a fast learner, or maybe both. Dad says there is no job too dirty or too small for Rachel. Showing horses is not all fun and games. There is much more involved than dressing up and going into the show ring. “She Mo Ready” is ready for The Celebration. Great story Tony. The paper could always use more stories like this one. Great story. Cannon County heritage still strong with Walking Horses. You gotta love it. Congrats Rachel.